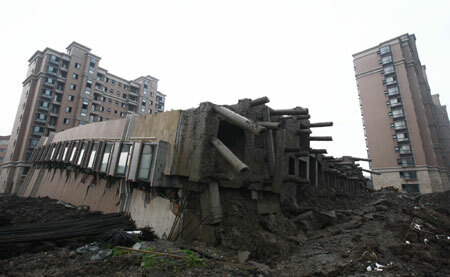 In 2009, an apartment building collapsed in Shanghai in a tragedy so dramatic than many suspected it to be an internet hoax. Nearly completed, it simply fell over and claimed the life of one worker inside. According to the Wall Street Journal, 489 of the 629 apartment units had been spoken for and would shortly have been claimed. The cause? A bad foundation. Soil had been excavated for a garage beneath the building and placed alongside the complex. When the wind and the rain came, the condensed soil shifted and tore at the foundation of the building and there was nothing to hold it up. Externally, the building appeared fine, but beneath the surface was imminent failure. People, this psalm teaches us, are the same way. Yesterday we studied how certain characteristics and activities keep people from being happy. Today, we look at happiness in a positive light: if I am to be happy, what can I emulate? Let us look first to experience. Many of us have had the pleasure of knowing certain people who are steady. It seems that whatever happens to them, they do not lose control. Do not mistake steadiness for the kind of plastic-faced smile that some people exhibit. Poor indeed is the character of a person who never weeps with their broken-hearted friend or never nods sympathetically with the plight of another. A steady person is far less superficial than that. The steady person may not be the first one to point out the light at the end of the tunnel, even when they see it, because they know that there is a time for weeping (Ecclesiastes 3:4). But they do not collapse when trouble comes, but stand tall through it. When you cry, they can cry with you because they know they will not fall into despair. When you laugh, they can laugh with you, without sinking to frivolity. What defines this steady person? Roots. You see, in contrast to the unrighteous person, the one who is blessed (happy) focuses on the law of God (the Bible). The righteous one thinks on God's promises and God's perfection instead of the faults of others and follows in God's way instead of the way of the wicked. Because this person does not draw their strength from shifting sands, but from the immutable God (Malachi 3:6), they can be happy regardless of their circumstances. A tree with deep roots will survive when the rain stops, because it draws on water you cannot see. The person with a strong private relationship with God will stand strong and prosper publicly. Someone who makes a big show of religion, but has no roots in private prayer and Bible study, will be scorched in the sun and blow away like chaff - this person is wicked, no matter what illusion they give. When we give into the American mindset of self-reliance, we do not develop roots. When we rely on God fully, then we can draw on a strength greater than ourselves. We can be steady in a tipping world. The correlation between this book of Psalms and Genesis is now plain: it is not about our situation, but our source. The God who started it will sustain it to the end, and to seek another source is to face ruin. May God help us to rely on him and not look to appearances, but to find a happiness which supersedes circumstances. Not an illusory happiness, but a real joy which goes down deep. May we read our Bibles not to pride ourselves on information, but to know God better. Let us pray, not as a magic wand nor a last resort, but as communion with our Lord. If you don't ordinarily read your Bible, the scriptures referenced at the start of each blog are a start. Pray about them. Ask God to help you apply them and talk to Him about your problems as if you were talking to a friend. It is a discipline well rewarded. If you enjoy this blog, please send some of your friends an e-mail about it or write them a note. Send them to MissionaryBaptist.Blogspot.com and don't forget to leave your comments or questions!